Leaves and other types of debris collect quickly in rain gutters. This can prevent moisture from flowing down and cause it to become trapped in dead leaves which will decompose and cause clogging. Water can end up in places it shouldn't and excessive moisture for prolonged periods can lead to mold and mildew. If the materials are metal, it can also cause rust to develop, which may eat through the gutter resulting in leaks. Clogged gutters will also begin to sag under the weight of debris, and it can cause an unattractive and unkept appearance. In most gutter systems, the water is directed into a downspout which carries the runoff into a more preferable location for drainage. If the water is not flowing through this pipe, you may have a clog somewhere in the downspout. Depending upon the size of the clog, it could be difficult to remove if you don't have the proper tools and equipment. If the problem is beyond the scope of your ability, it may be time to seek professional gutter cleaning assistance. Experts in this field maintain an arsenal of tools that make cleaning the more difficult parts of the gutter system fast and easy. Gutter cleaning is generally easy to perform. Use a sturdy ladder to reach the gutters and remove the debris thoroughly. Check for any leaks, cracks or loose rivets/fasteners while you're there. Check to see if the gutters have pulled away from the walls in any spots. If fasteners are missing, replace them. Make any minor gutter repair that is needed. Installing gutter filters is an additional measure that can help to keep debris out of your gutters and lessen the need for you to clean gutters as frequently. How often is gutter cleaning needed? The frequency of routine rain gutter cleaning depends on the location of your home and the weather conditions. If there are trees and other types of vegetation around the house, a strong wind can easily dislodge the leaves and small branches sending them directly into your rain gutters. You should inspect them every few months and especially after a strong windstorm. Homes that are not close to trees and other plants may not require cleaning as often. 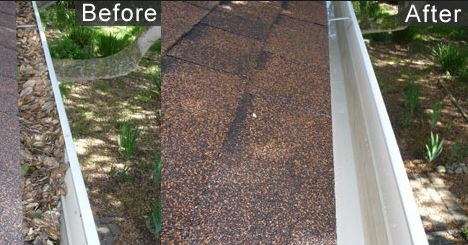 ​Although most people can perform routine gutter cleaning tasks without issue, there are others who are unable. If your gutters need attention in the Hamilton, Ohio area, Hamilton Gutter Pros are available to help. We offer a variety of roof gutter services including sheer flow gutter filter installation and cleaning of gutter downspouts. Come in and discuss your situation and we're happy to give you a quote for our affordable gutter cleaning cost.